D. Jia, X. Bi, C.J. Lim, S. Sokhansanj, A. Tsutsumi, “Heat transfer in a tapered fluidized bed of biomass particles with pulsed gas flow”, Particuology, (2018). D. Jia, X. Bi, C.J. Lim, S. Sokhansanj, A. Tsutsumi, “Heat Transfer in a Pulsed Fluidized Bed of Biomass Particles”, Industrial & Engineering Chemistry Research, 56 (2017) 3740-3756. D. Jia, X. Bi, C.J. Lim, S. Sokhansanj, A. Tsutsumi, “Gas-solid mixing and mass transfer in a tapered fluidized bed of biomass with pulsed gas flow”, Powder Technology, 316 (2017) 373-387. D. Jia, X. Bi, C. Lim, and A. Tsutsumi, “Biomass Drying in a Pulsed Fluidized Bed without Bed Particles”. Fuel.186 (2016) 270-284. D. Jia, J. Peng, X. Bi, C. Lim, Y. Liu and A. Tsutsumi, “Fluidization and drying of biomass particles in a vibrating fluidized bed with pulsed gas flow”. Fuel Processing Technology. 138 (2015) 471-482. J. Peng, X.T. Bi, C.J. Lim, H. Peng, C.S. Kim, D. Jia, H. Zuo, “Sawdust as an effective binder for making torrefied pellets”, Applied Energy, 157 (2015) 491-498. J. Peng, J. Wang, X.T. Bi, C.J. Lim, S. Sokhansanj, H. Peng and D. Jia, “Effects of thermal treatment on energy density and hardness of torrefied wood pellets”, Fuel Process. Technol., 129 (2015) 168-173. D. Jia, H. Zhao, AS. Berrouk, C. Yang and H. Shan. “Numerical study of counter-current gas-solid flow in FCC disengager and stripper”, The Canadian Journal of Chemical Engineering. 2014;92(1):176-188. D. Jia, X. Bi, C.J. Lim, S. Sokhansanj, A. Tsutsumi, “Mass transfer in a tapered fluidized bed of biomass with pulsed gas flow”, in: J. Chaouki, F. Berruti, X. Bi, R. Cocco (Eds.) Fluidization XV, ECI Symposium Series, Montebello Quebec, Canada, 2016. D. Jia, X. Bi, C.J. Lim, S. Sokhansanj, A. Tsutsumi, “Fluidization and Drying of Biomass Particles in a Vibrating Fluidized Bed with Pulsed Gas Flow”, in: X. Bi (Ed.) 5th International Conference on Biorefinery. Vancouver, British Columbia, Canada, 2015. D. Jia, J. Grace, C.J. Lim and X. Bi, “Brief Report on Final Commissioning of 2-D Fluidized Bed Column for Zinc Roasters at Teck Trail Operations”. Final report to GLAB Reactor and Fluidization Technologies. 2017. D. Jia, X Bi, “Design options for the microwave-assisted fluidized bed pyrolysis of biomass, source of fluidization medium and energy”, Preliminary report to the Canadian Foundation for Innovation and UBC Intellectual Property Office, 2018. D. Jia, X. Bi, C.J. Lim, S. Sokhansanj, A. Tsutsumi, Heat transfer of biomass particles in a tapered fluidized bed with pulsed gas flow, in: M. Olazar, C.J. Lim, W. Zhong, M.A.S. Barrozo (Eds.) 7th International Symposium on Spouted Beds. Barcelona, Spain, 2017. D. Jia, X. Bi, C.J. Lim, S. Sokhansanj, A. Tsutsumi, Heat transfer in a pulsed fluidized bed of biomass, in: H. Jin, Y.-H. Lee (Eds.) Asia-Pacific Forum on Renewable Energy. Guangzhou, China, 2016. D. Jia, X. Bi, C.J. 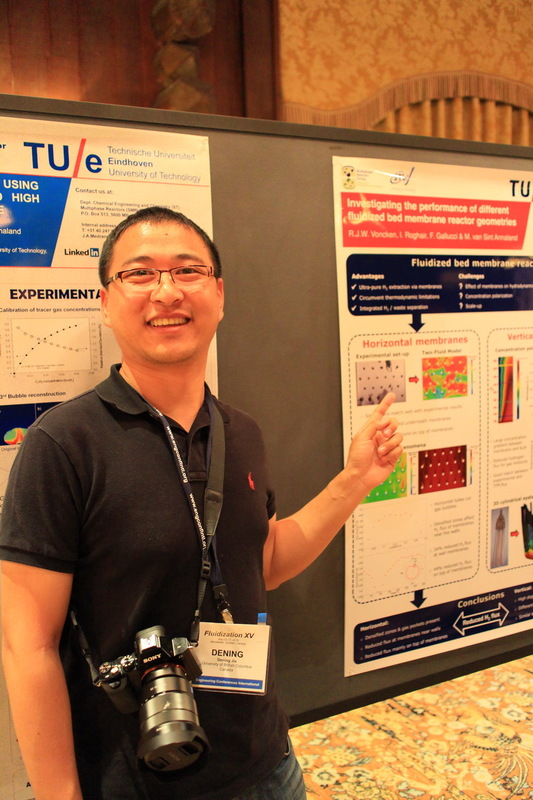 Lim, S. Sokhansanj, A. Tsutsumi, Gas-solid mixing and mass transfer in a tapered fluidized bed of biomass with pulsed gas flow. Fluidization XV. Montebello Quebec, Canada, 2016. D. Jia, H Zhao, C. Yang and H. Shan. “Numerical Simulation of the Counter-Current Gas-Solid Flow in FCC Stripping Section”, Canadian Chemical Engineering Conference. London, Canada, 2011. Ensured timely progress of the project and clear communications between all parties, led a team of graduate students towards their research objectives. Documented findings into technical reports and wrote work procedures for the operators. Coordinated with onsite engineers of other discipline and project support staff. Facilitated publication of 7 papers and dispatch of two additional academic exchanges. Programmed a monitoring, online analysis and control system in LabVIEW, incorporated multiple capacitance probes, over 40 thermocouples and pressure transducers. Accurately marked and graded assignment work and examinations. Graded weekly lab reports while ensuring assignments were technically appropriate. Delivered a range of modules during the course of semester on behalf of the professor. Updated problems in the assignments that better reflected the current teaching goal. Graded all assignments and exam papers, offered consultation to students. Identified sustainability-oriented courses in the Faculty of Applied Science and experiences that students could pursue alongside their disciplinary major, drafted strategy proposals for implementing undergraduate curriculum changes. Prepared conference programme book and prospectus for attendees and sponsors. Contributed to the conception of Knowtions.com, a professional translation initiative (now acquired by Google and contracted by Elsevier for textbook/journal translations). Translated and edited 100+ English-Chinese and Chinese-English technical literatures with very high customer satisfaction. Held workshops teaching entry-level users and seniors computer problems. Contributed to the recycling and repurposing of old computer hardware by re-installing Windows/Linux, disassembling and sorting out parts containing precious metals. Heat and mass transfer in multiphase systems. Awarded for the graduate student who makes the most outstanding seminar presentation in the Department of Chemical and Biological Engineering’s annual seminar series. Awarded to full-time UBC students accepted into a research abroad program through Go Global. Engineering scholarships awarded for higher education students in British Columbia with research excellence. Awarded to graduate students in chemical and biological engineering who demonstrate academic excellence and potential for service to society by performing research on energy, environment and multi-phase systems. Merit-based scholarship awarded to graduate students in the discipline of applied science in the University of British Columbia. Awarded to graduate students at China University of Petroleum (East China) with high academic achievements. Data analysis: Proficient in OriginPro, DiaDem and Excel. Multimedia: Proficient in Adobe Photoshop, Adobe Photoshop Lightroom, VegasPro and Audacity. CAD: Proficient in AutoCAD, AutoCAD Inventor Professional, familiar with SOLIDWORKS.